Some people join the templestay program to fight illness while others visit the Buddhist sanctuaries to spend more meaningful time or savor healthy temple foods. The reasons vary, but there is one common denominator for the participants ― peace of mind. “The templestay program is a cultural movement to awaken people who live with the hustle and bustle of a mundane world into a world of finding happiness in themselves and sharing it with others. It is not a propagating program that is intended to turn the participants into Buddhists. If it were, it could not have been continued for 10 years,” Ven. Popchin, director of the Cultural Corps of Korean Buddhism, an affiliation of the Jogye Order, said in an interview with The Korea Times. More than 70 percent of those who partake are non-Buddhists, a recent survey showed, attesting to the popularity of the program that marks a decade this year. It was initiated ahead of the 2002 Korea-Japan World Cup but the idea had burgeoned long before. “Some might say the program was launched to provide accommodation as the international event drew foreign tourists. But it was totally wrong. 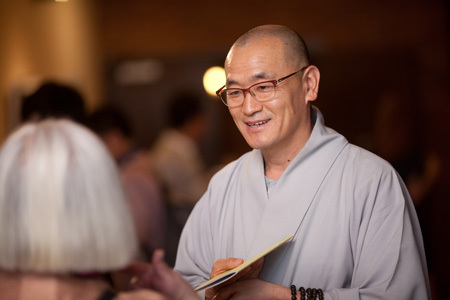 The sect has purely pursued a cultural movement from the beginning to help people learn something by experiencing monks’ lives,” he said. In China and Japan, there are similar programs run by temples, which provide accommodation for visitors but they differ from the Korean program. “Our templestay program is very unique and special in that we offer traditional culture rather than Buddhism itself. It is very open to anybody and embraces all classes, religions and nationalities,” he said. The templestay program, which marks the 10th anniversary of its inception this year, has attracted 1.9 million visitors until 2011. Through the program, the sect is becoming more open-minded to other religions and caring for social minorities to bring humanity into society and a balance of body and mind for individuals. He said during the past decade the Jogye Order has focused on laying the foundations and attracting participants but from now it will put more emphasis on the quality of the program. The templestay initially began with 33 temples in 2002, a figure that rose to 109 this year. The program also saw an average 30 percent increase per year in participants, totaling up to 1.9 million visitors as of the end of 2011. “The number of the participants is not that important for us now. More participants might ruin the natural environment where most temples are located. We are now focusing on diversifying the participants to balance the program, for example, embracing more social minorities,” he said. The organization launched a tour program three years ago to invite the homeless and multiracial families. This year, the program invites students suffering from school violence. Even other religious leaders are invited to tour the sacred places including Buddhist temples in a reciprocal gesture. “We’re making efforts to integrate diverse social classes. It’s the future direction of the templestay program for the next decade and ultimately the role of religion in the 21st century in a material-oriented society,” he said. The director who is widely involved in overseas activities sees an increasing number of foreigners getting interested in Korean templestays. The program is widely known in other countries, according to the director. “In the past, those who I met abroad easily associated Korea with taekwondo or North Korea. But now wherever I go, people talk about the templestay program. It’s now a national brand representing Korea,” he said. “Foreign participants are important for us. They are eager to join the program if given a chance. Foreigners want to experience Korean traditional culture in the Buddhist temples which have more than a 1,700-year history,” he said. It is rather easy to satisfy foreigners because their reasons are simple and clear. “They like meditation, Buddhist ceremonie, and talking with the monks. Immersion in the monks’ lives is the best way for them. Making a special program might be too artificial and it’s not proper for the spirit of the templestay program,” Popchin said. Instead, foreigners need more interpreters to explain the monastic lives and Korean Buddhist culture and want cleaner accommodation. Presently, the organization runs 16 temples specializing in interpretations for foreign tourists. The programs vary in content ranging from monastic programs, relaxing templestays and templestays featuring specialized themes. 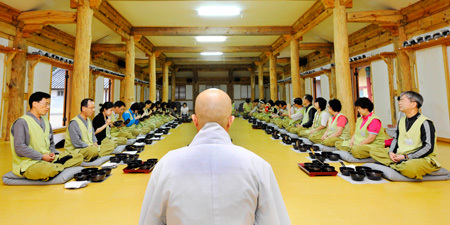 The participants can enjoy the Buddhist ceremony called “yebul,” formal monastic meal services, Zen meditation, a tea ceremony known as “dado,” making lotus lanterns, and 108 prostrations. The organization is offering a special event titled “Finding Happiness Within Myself” from Nov. 1 to 4 at Jogye Temple in downtown Seoul. 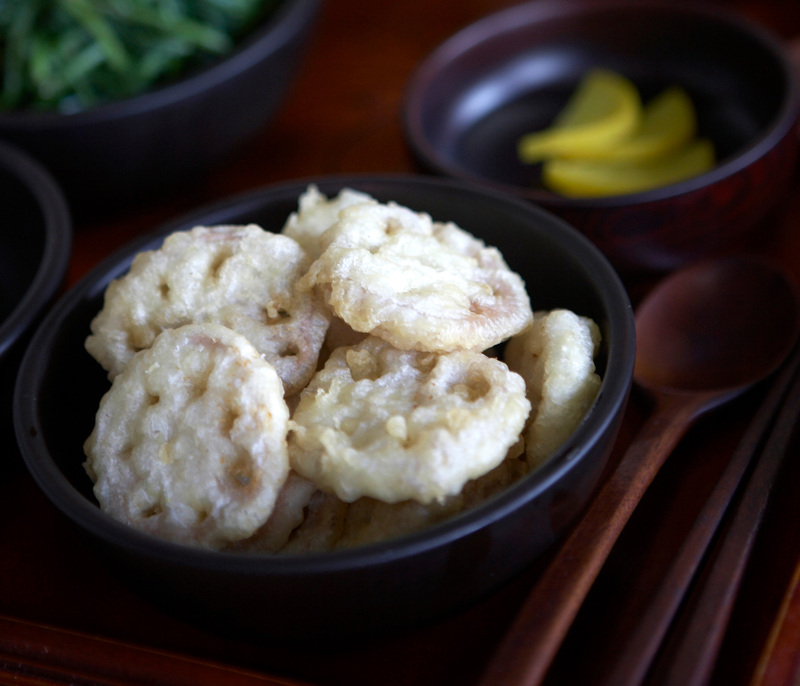 The event consists of an experience zone and a traditional temple food zone. The experience zone invites 1,000 people who want to create a mandala (Buddhist painting) together and make traditional rice paper, sutra printings and rubbings. The food zone exhibits how Korean temple food used to be and its modern interpretation and a photo display of seasonal Koran temple foods along with tea and conversation with a monk.